Smart shopping service Decide.com, which started off with a focus on consumer electronics before its recent addition of home appliances, is a unique player in the comparison shopping market. The service doesn’t just return prices and reviews, it actually tells whether to buy or wait to buy a given product by analyzing market conditions, trends, news, product release history, and more. Today, that same shopping experience has arrived in a handy new format: an iPad app. The company also talked today about its plans to expand to new verticals in the months ahead. 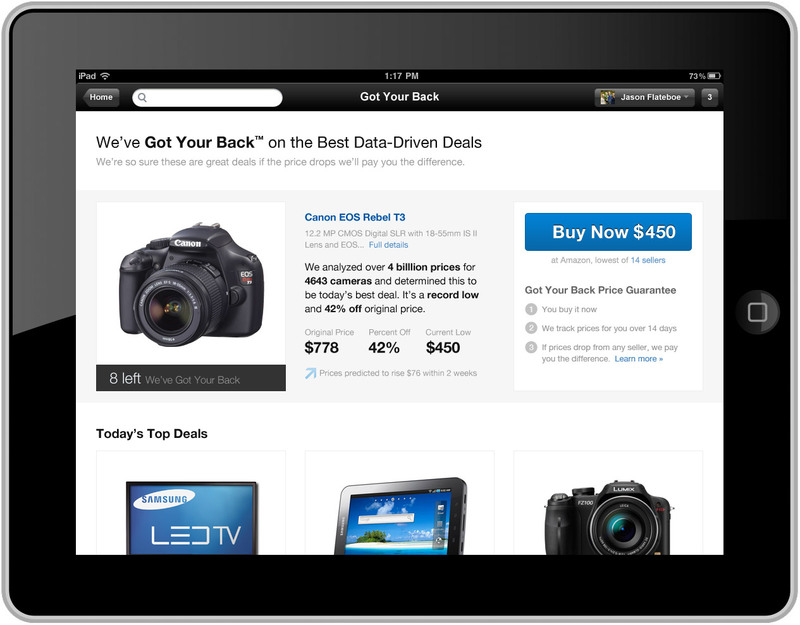 Already live on iPhone and Android, the Decide.com iPad app now sources the same content – over 500,000 products – which can be swiped through via the HD/Retina glow of the iPad’s screen. The app also allows users to track favorite items and set alerts which work across all of Decide.com’s properties, including its iPhone and Android apps, as well as its website. Plus, the iPad app offers access to Decide’s newly launched “daily deals” lineup, which consist of selected products backed by price guarantees. If you end up purchasing a daily deal item, and the price drops within two weeks at any participating retailer, Decide.com pays you the difference. The Seattle-based company, founded by former Farecast engineers, has been ramping up quickly over the past few months. In addition to its daily deals and expansion to home appliances, the company also recently brought Shauna Causey on board as the VP of Marketing. Causey previously managed communications, community relations and social media strategy for companies and organizations including the Seattle Mariners Baseball Team, Fox Sports Net, WB, Comcast and, most recently, Nordstrom. The move to the iPad platform should help Decide.com see a jump in usage, as already 40% of its traffic comes from mobile devices. (Incidentally, 40% is Fab.com’s mobile number, too.). In fact, even prior to today’s launch, the iPad was the source of the most mobile traffic for the company before the iPhone app hit. Since the Seattle-based company’s launch in 2011, its price predictions have been 77% accurate, and the average savings are at $87 per product, the company claims. To date, those savings – over some 18 billion price observations – would total $72 million+ in potential savings for shoppers. CEO Mike Fridgen tells us that Decide has increased its product coverage by 25 times since launch, and today covers over 77 electronics and appliance categories. He adds that the company is now planning to expand into every major household category this year. Meaning what, exactly, we asked Fridgen? “All ‘highly considered’ purchase categories, including Sports & Outdoors, Home & Garden, Tools & Hardware, Baby & Kids, Jewelry & Watches,” he explained. “We are targeting these major categories by year-end. From there, going into next year, we plan to explore other categories, such as cars,” he added. I guess you can’t call Decide a gadget search engine much longer. Also of note, the company has been piloting a program where its buy or wait recommendations are served up on Bizrate, and it will expand to cover more of its appliances and electronics categories in the coming weeks.